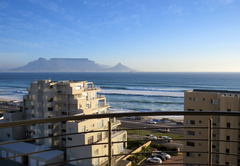 Oceanview Apartment is a property providing self catering in Bloubergstrand for up to 4 guests visiting the Blaauwberg region. 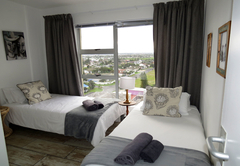 Situated in Bloubergstrand, Oceanview Apartment is a self-catering apartment that is able to sleep up to four guests. 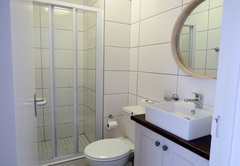 Secure parking is provided in a lock up garage and the apartment has braai facilities and a balcony with a table and chairs. 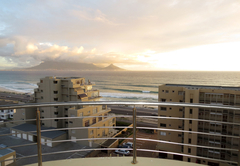 The beach as well as shops, restaurants and various activities are within walking distance. 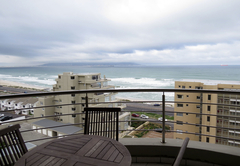 Oceanview Apartment is fully equipped apartment and has two bedrooms. 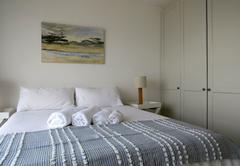 The main bedroom is furnished with a double bed and has an en-suite bathroom. 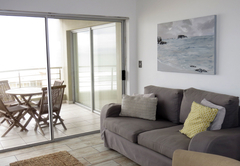 This room opens via sliding doors onto a balcony. 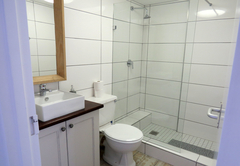 The second bedroom has two single beds and makes use of a full bathroom. 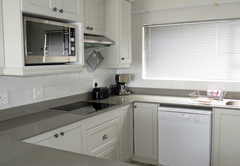 There is an open plan living area with a kitchen, lounge and dining space. 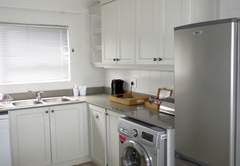 The lounge is comfortably furnished and the kitchen is equipped with a stove, fridge / freezer, convection microwave, dishwasher, coffee machine, washing machine and tumble dryer. 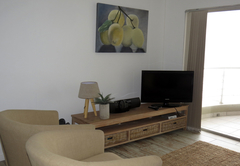 The open-plan living area has a TV with DStv and opens onto the balcony. 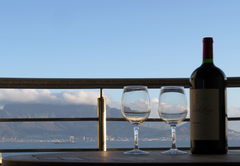 The V&A Waterfront is less than 20kms away and Canal Walk is just 12km drive. 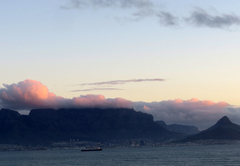 The My Citi bus operates from this area making travelling easy and accessible. 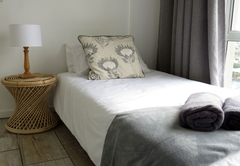 The unit accommodates 4 guests in a 2-bedroom apartment with views of the sea from the main bedroom as well as the lounge.The main bedroom contains a double bed, an en-suite bathroom.The second bedroom has twin single beds. Response timeOceanview Apartment typically responds to requests in 5-10 minutes.